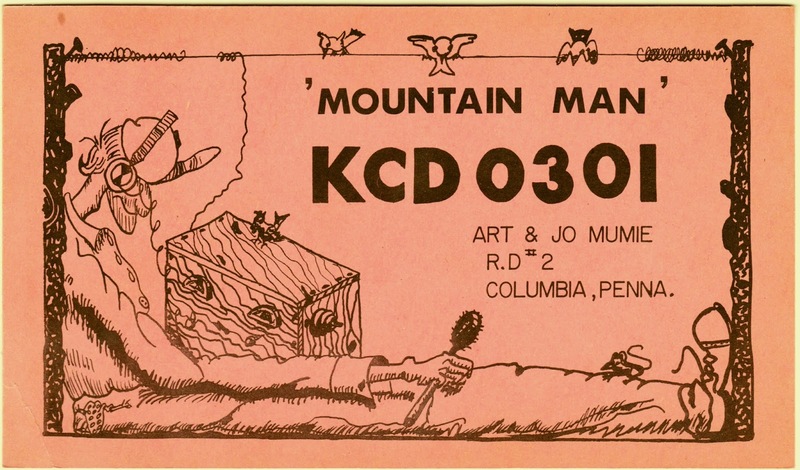 This undated, never-used York County QSL card, with the call sign KCD 0301, was for Art and Jo Mumie of Columbia, Pennsylvania. Apparently "Mountain Man" was their nickname, and there is a definite "out in the woods" feel to the illustration on the card. The ham operators' full names are probably Arthur A. Mumie and Joann Ann Mumie. They are senior citizens now and probably trying to keep their lives quiet and low key, so there's no need to delve any further on them. It's enough that this little slice of one of their hobbies from about a half-century ago has now been saved for posterity. It's a cool QSL!